Healthy Hot Tubs provide hot tub repairs and servicing in Birmingham and the surrounding areas through our local Midlands engineers. So if you have a hot tub problem, need a quality service, or just some expert advice, feel free to call us on 08007720652. 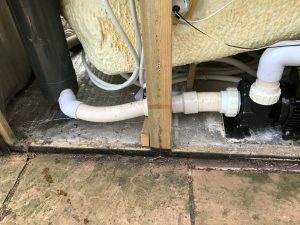 Below you can view some examples of hot tub repairs and servicing we have carried out in Birmingham and the surrounding areas. On a routine service in Selly Oak our engineer spotted a leak from the filter housing. After speaking with the customer they confirmed they were topping up the water every week. They advised they were losing three to four inches a week. Firstly our healthy hot tubs midlands engineer emptied the tub. This is part of our full service package having flushed the tub with pipe cleaner. 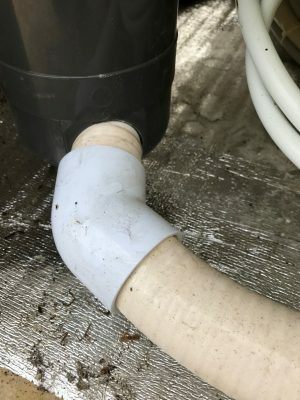 It was quite clear that the pipe had started to come out of the filter housing. Years of good use and chemicals may have finally taken there toll on the glue. 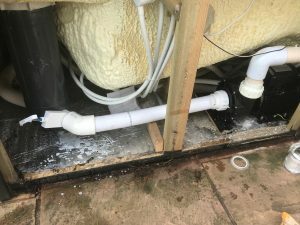 Our Birmingham service and repair engineer replaced the whole pipe and seals to ensure a good repair. The Service was then completed leaving both an happy customer and engineer. Finally no additional labour was charged for this repair. Our service price covers any labour that can be carried out during a full service. Alternatively fill out our contact form. Healthy Hot Tubs cover Birmingham for hot tub repairs and servicing including Birmingham, Bromsgrove, West Bromich, Halesowen, Solihull, Dudley, Walsall, Wolverhampton, Stourbridge, Sutton Coldfield, Redditch and Tamworth to name just a few. We also provide servicing and repair contracts for all our customers including rentals and holiday parks. For examples and information check out our maintenance and service contracts blog. Or go straight to the contracts page and select the contract you would like and contact us to set it up.